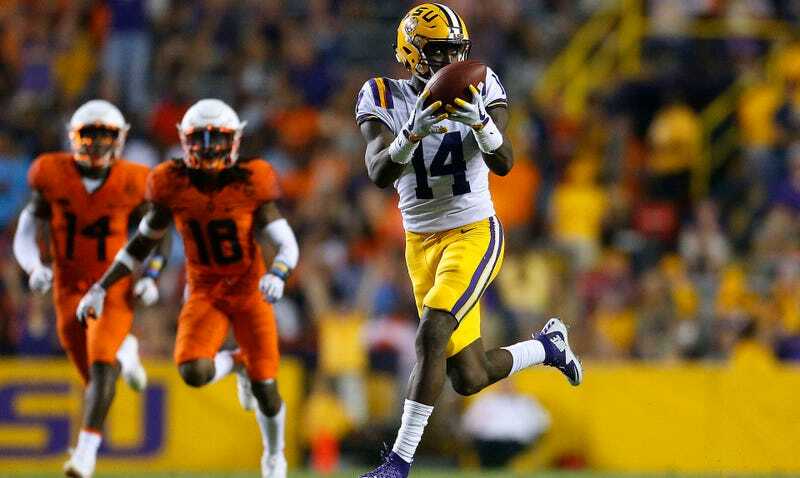 On Friday, junior LSU receiver Drake Davis was arrested and charged with second-degree battery. A woman accused him of hitting her four separate times over the last 18 months, during which Davis allegedly broke her rib, choked her, and texted her “I might kill you.” The alleged victim told police she had been dating Davis since January 2017, until they broke up this month. She told the cops that Davis first attacked her in May 2017, then in April and June of this year. According to WBRZ, there’s no date specified for the fourth incident, where she says Davis choked her in his car after she waved at a friend. Davis posted a $5,000 bond and was released by the East Baton Rouge Parish jail on Saturday. According to East Baton Rouge District Attorney Hillar Moore, that’s not true. Moore told reporters today that while the alleged victim wanted to alter parts of her original statement, she spoke to him and “did not say she wants the charges dismissed.” The charges apparently still stand, and the police are still in the process of conducting their investigation. At a hearing today, a judge ordered a 10:00 p.m. curfew for Davis, which will be enforced by a monitor.